WHEN: Today, April 11, 2016, started at 6:00 a.m. DETAILS: SYTIC workers went on strike today, setting up a picketline in time for the 6:00 a.m first shift of work. Production at the factory is now paralyzed. 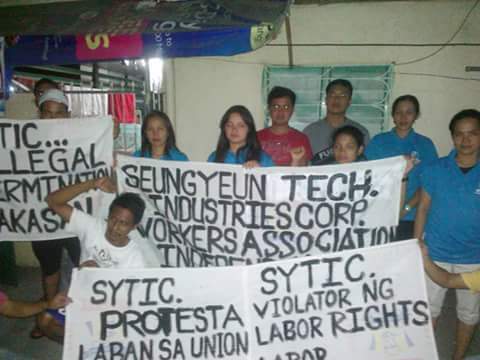 At 8:00 a.m. PM members will hold a solidarity rally at the Cavite EPZA main gate (gate 1) in support of the SYTIC workers on strike. SYTIC workers are demanding the reinstatement of 20 union officers and members who were terminated for their union activities, respect for the right to unionize and the redress of violations of labor standards on wages, overtime and health and safety.